Partway between mainland Europe and Africa in the Mediterranean Sea lies the small island of Malta and its even smaller neighbour Gozo. These islands are best known for their megalithic temples built by Neolithic inhabitants some five to six thousand years ago. The temples are a testament to a tradition of prehistoric architecture that is totally unique to this part of the world. Recognising their international importance, UNESCO classified six of them as part of the ‘Megalithic Temples of Malta’ World Heritage Site. Not surprising then the temples are a popular tourist attraction. Read Ethan’s tips for visiting the megalithic temples on Malta and Gozo. 1. What shouldn’t I miss? 2. What about the museums? 3. Are there combination tickets? 4. Where should I stay? 5. Do I need to plan ahead? 6. What about the Ħal-Saflieni Hypogeum? 7. How do I get to the temples? 8. Can I join a guided tour? 9. Where can I get food and drink? 10. Are there toilets and gift shops? Over the centuries, archaeologists have discovered at least twenty megalithic temples on Malta and Gozo. Unfortunately many are not open to visitors, but the six that make up the UNESCO World Heritage Site are. No keen prehistorian can visit Malta without seeing these at least. Mnajdra Temple overlooks the Mediterranean Sea. By far the best-known temples are Mnajdra and Ħaġar Qim, perched within 500 metres of each other on Malta’s south-eastern coastline. Built from limestone, both temples have suffered from weathering since archaeologists excavated them in the 19th century. To prevent further destruction, large protective tents now cover both sites, while a visitor’s centre exhibits a small collection of the artefacts discovered there. Within walking distance of the temples are the Misqa Tanks, potentially prehistoric water storage tanks carved into the natural rock, as well as the Ħamrija Tower built for defence in the 17th century (Read More About the Coastal Towers of Malta & Gozo). 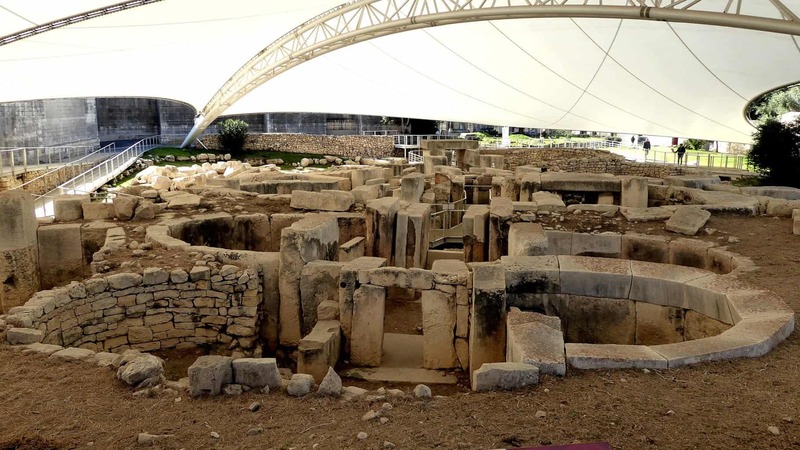 Back in the more urbanised eastern side of Malta is the Tarxien Temple, a complex of Neolithic buildings that were later used as a Bronze Age cemetery. 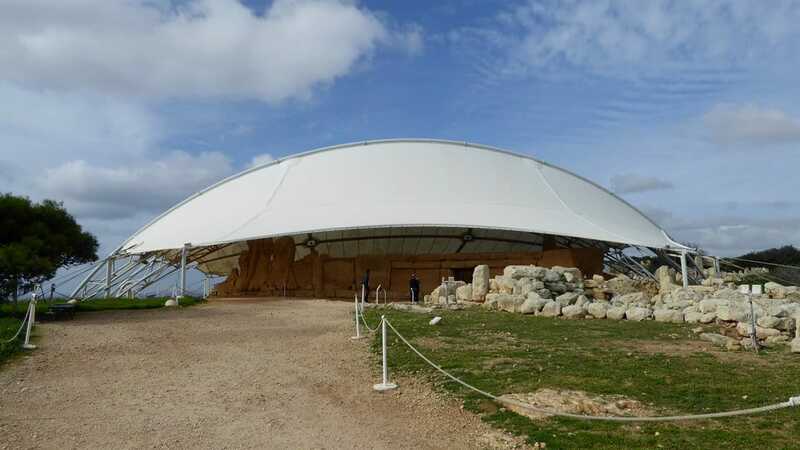 Like Mnajdra and Ħaġar Qim, a large protective tent now encloses them to prevent any further destruction from the Mediterranean elements. A short walking distance from the Tarxien Temples is the Ħal-Saflieni Hypogeum, a subterranean rock-hewn cemetery complex discovered in the early 20th century. Although considered separate from the megalithic temples themselves, since 1980 it has been classed as a UNESCO World Heritage Site in its own right. Heading to the north of the island, one can find the Ta’ Ħaġrat and Skorba temples. The former is in the town of Mġarr and the latter in the nearby village of Żebbiegħ. Although not as impressive as temples like Tarxien and Mnajdra, both sites are highly recommended. Neither currently have a protective tent, and therefore offer a sensory experience of the sites as they exist in their fully outdoor environment. 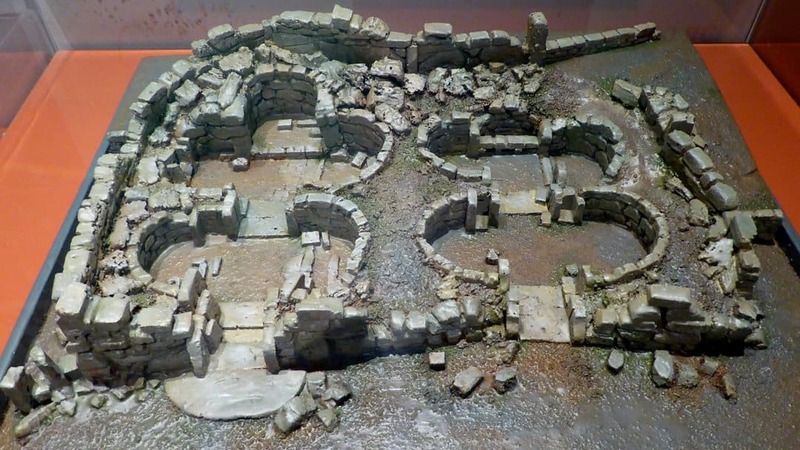 Model of the Ġgantija temples on display in the National Museum of Archaeology, Valletta. In Gozo, the Ġgantija temples are among the most impressive of all those on the Maltese islands. Here, two temples stand side by side, encircled by the same megalithic wall and overlooking Nuffara Hill, home to a Bronze Age settlement. Like the temples at Skorba and Ta’ Ħaġrat, the Ġgantija temples are still open-air, although the overall impression is hindered slightly by scaffolding and metal girders holding parts of the temple in place. As well as the temples themselves, the Maltese islands boast several museums containing artefacts found during site excavations. 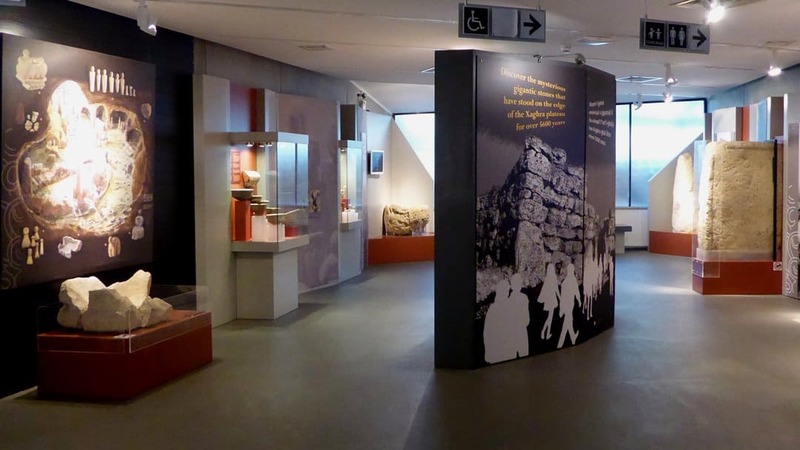 In several cases, the two are linked: with impressive modern exhibits on display at Ġgantija as well as the Mnajdra and Ħaġar Qim visitor’s centre. The latter even includes a brief interactive cinema experience taking the viewer through thousands of years of history. Permanent exhibition on the megalithic temples in the National Museum of Archaeology, Valletta. Definitely worth a visit is the National Museum of Archaeology in Valetta. Although some of the rooms and labels are a bit dated and tatty, the museum’s collection of prehistoric artefacts is among the finest in Europe. It includes various engraved and patterned megaliths as well as a fascinating collection of rounded female figurines, including the famous Sleeping Lady sculpture. I recommend visiting this museum before any of the temples themselves, to get a better appreciation for the periods in question. Set aside at least two hours to ensure that you see everything. 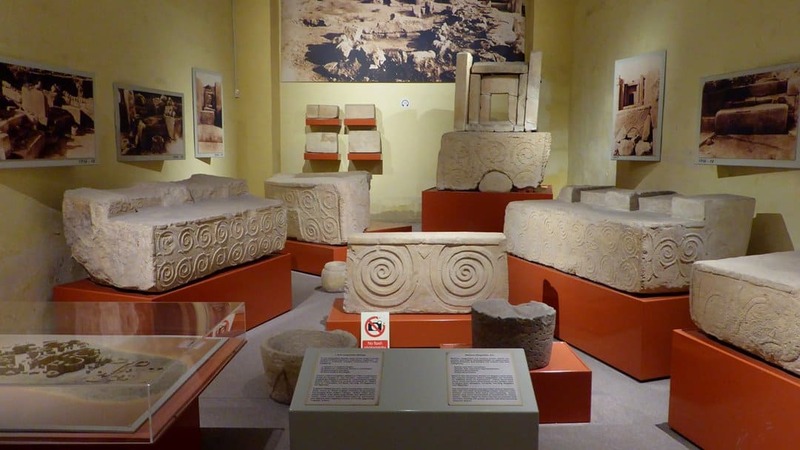 When in Gozo, consider popping into the Gozo Museum of Archaeology, a small affair located in the Medieval citadel of the Gozan capital city, which is known as either Victoria or Rabat. Although its prehistoric collection is restricted to a few sparse cabinets, it includes several interesting items excavated from the Ġgantija Temples and Xagħra Stone Circle (the latter sadly closed to the public). For those with an interest in later periods, the rooms devoted to Roman and Medieval archaeology are more likely to impress. The entire museum can be seen in 20 to 30 minutes, and is ideally paired with a wider exploration of Victoria’s Medieval fortifications. The best option for those wanting to visit all the sites mentioned here might be to buy the Multisite Pass, which costs €50 for adults, €38 for students and retired people, and €25 for children. It remains valid for 30 days from its first use. This allows entry into all the sites mentioned here except the Ħal-Saflieni Hypogeum. 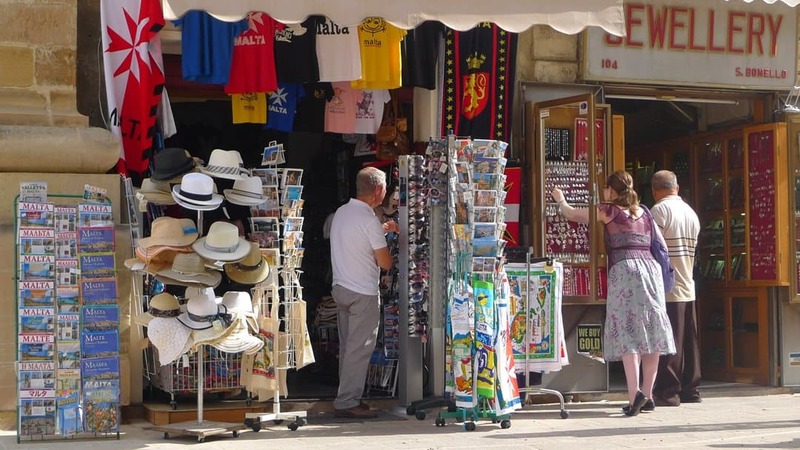 In addition, it permits entry to a wide range of other sites of archaeological and historic interest across Malta and Gozo, and gives a 10% discount in Heritage Malta shops. In all the pass gives access to 23 sites and museums. This is a good option for those who intend on visiting not just the temples but other sites as well, particularly if you are staying on the island for two or more weeks. Those with a more limited time in Malta would be financially better off purchasing individual tickets for specific sites. In those cases where the temples are close to one another, one tickets serves entrance to both sites. The most obvious case of this is at Mnajdra and Ħaġar Qim, which are covered by a single entry-fee. Similarly, only a single ticket is provided for both Skorba and Ta’ Ħaġrat; I should add that the ticket also includes entry to the Ta’ Bistra catacombs, dating from the late Roman period. When on Gozo, the entry ticket to Ġgantija also permits entry to the nearby Ta’ Kola Windmill, built in the 18th century. Tickets to the Gozo Museum of Archaeology entitle you to entry to the Cittadella Visitor Centre, Gran Castello Historic House, Gozo Nature Museum, and Old Prison. Unfortunately, due to time constraints, I was only able to visit the archaeological museum. Those on a day trip to Gozo from Malta should similarly not expect to include all these sites into their itinerary, particularly if you wish to visit Ġgantija. The megalithic temples are scattered across Malta and Gozo, rather than being clustered in any one area. It is therefore impossible to stay in one place that puts you in walking distance of them all, and – unless you hire a car – public transport will be essential. Malta’s transport hub is on the western outskirts of its capital city, Valetta. Encircled by walls and towers built between the 16th and 19th centuries, this small yet beautiful city is located on the island’s eastern coast. Basing yourself in the west of Valetta or just outside of it places you in the best position to make use of the country’s transport links. I stayed in Floriana, a more rough-and-ready, working-class area to the west of the city, which meant that I had to walk for less than five minutes to the bus stop each morning, an ideal situation for the archaeological explorer. Being located in either Valetta or Floriana also means that you have access to a wider range of eateries, bars, and shops than are present in most other parts of Malta. It also means that you are in walking distance of the city’s various attractions, which include the National Museum of Archaeology, the 16th-century Saint John’s Co-Cathedral, and the palatial Casa Rocca Piccola. As well as connecting you with transport links to archaeological sites, it also ensures that you are only a thirty minute bus ride away from the night-life hub of St Julian’s, ideal for those wanting to party on a Friday or Saturday night. One thing I learned (at times to my cost) during my trip to Malta is that it really is important to plan ahead when it comes to visiting the temples. This is particularly the case with Skorba and Ta’ Ħaġrat, which are off the main tourist trail and only open on Tuesdays, Thursdays, and Saturdays. Tickets cannot be purchased at the sites themselves, but must be obtained either online (here for Skorba, and here for Ta’ Ħaġrat) and/or beforehand at the National Museum of Archaeology, which is located on the other side of the island. 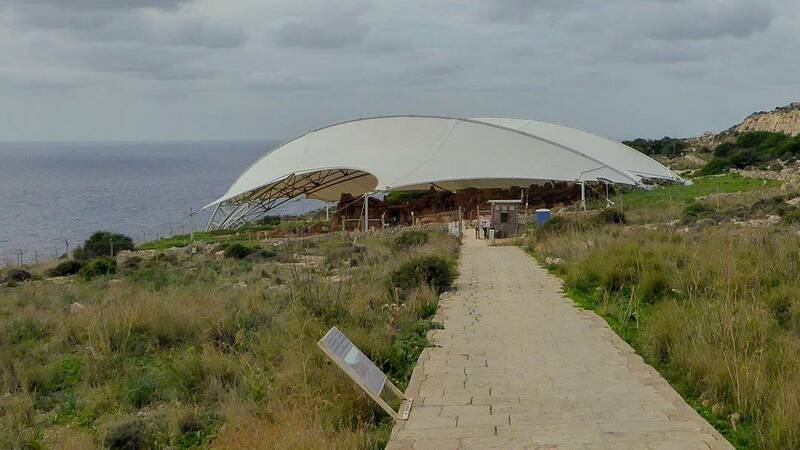 Those hoping that they will be able to see these two sites without a prior ticket will be disappointed; I saw one man being turned away from Ta’ Ħaġrat by a security guard for arriving without a ticket. It is also important to make sure that you know exactly where each site is and how to get there. While sites like Mnajdra and Ħaġar Qim are well-signposted and easy to find, the others are not. I would therefore recommend that you make use of a good printed map or online resource like a Google Map, and if using public transport ask the bus driver to let you know what stop to get off at. What about the Ħal-Saflieni Hypogeum? Perhaps the jewel in the crown of the Maltese megaliths is the Ħal-Saflieni Hypogeum, a subterranean cemetery in Paola. Unfortunately, I never got to see it. To preserve the site, only eighty visitors are allowed in per day, and demand is high. I had hoped to obtain a ticket once I had arrived in Malta, although by that point it was fully booked. Planning again! Avoid making the same mistake as I did and reserve your slot before travelling to the island! You can book online on the official Heritage Malta website. For peak tourist seasons tickets are booked up well in advance. 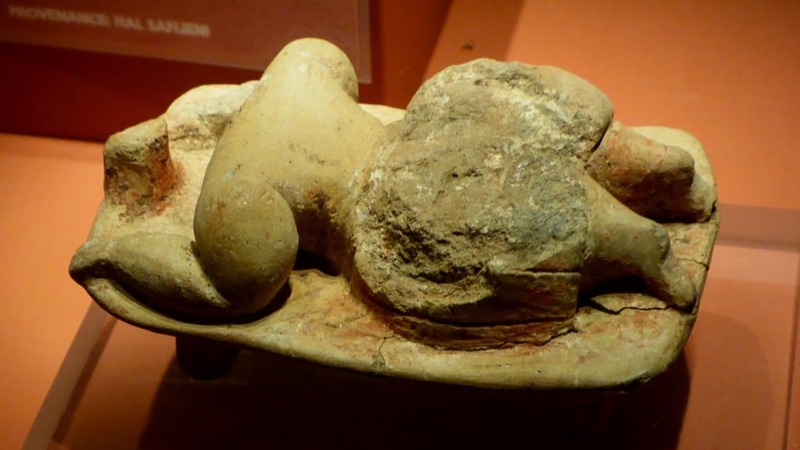 The so-called ‘Sleeping Lady of Ħal-Saflieni’, now on display in the National Museum of Archaeology in Valletta. How do I get to the temples? Malta has no railway system and thus sites can only be reached by road. One option is to hire a car, although it might prove difficult to find parking spaces if staying in or around Valetta. Roads are typically small, winding, and (in urban areas) congested, which may put-off some drivers. Sites like Mnajdra/Ħaġar Qim have a car park although others, like Ta’ Ħaġrat, Skorba, and the Tarxien Temples, will require parking in a nearby road. Another option is to use public buses. This was how I got around most of Malta, and was pleasantly surprised to find that a 7-day pass cost only €21 (€15 for children). This pass could be purchased from the airport or the bus station outside Valetta. 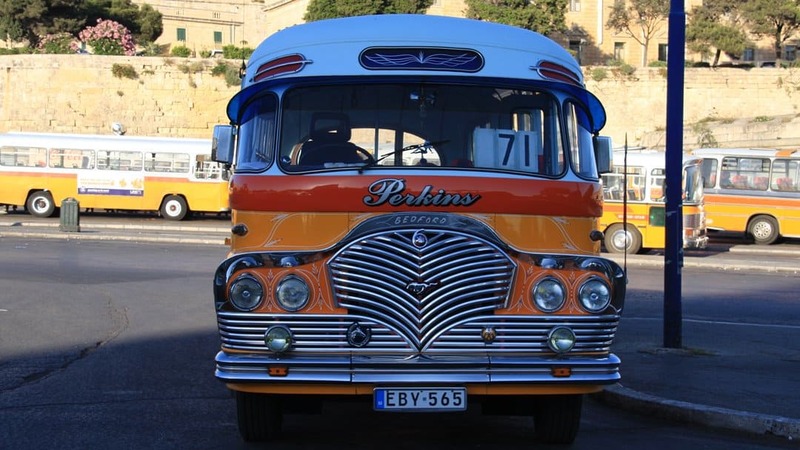 From the city, I was able to get buses to every one of the temples on Malta itself and thus it was certainly satisfactory for my needs. The downside however is that the public buses are unreliable. I found that they rarely arrived at the designated time and often got bogged down in congestion. There were occasions where I had to wait for well over an hour for a bus and the likelihood of delays had to be factored in when planning my itinerary each day. Another option is to use the Hop On-Hop Off bus service run by a private company. This is the more expensive option, with tickets being €18 for adults (€10 for children) and only remaining valid for one day. It is nevertheless more reliable than the public transport service, with these buses arriving at each stop every 45 minutes. This service is primarily designed for general site-seeing rather than for the narrower pursuit of megalith hunting, although still holds advantages for archaeological explorers. I used the Hop On-Hop Off service during my day trip to Gozo, and although it meant following a set route rather than heading straight for Ġgantija, it had the benefit of an accompanying audiotrack informing me of the history of the places we were passing through. I would certainly recommend it for those wanting to see as many historical and natural beauty sites as possible during a day-trip. As well as using cars or buses, some walking will also be inevitable. From Ħaġar Qim to Mnajdra, for instance, is a 500-metre pathway. This is a smooth and easy walk, although those wishing to branch off the trail to visit nearby sites like the Misqa Tanks and the Ħamrija Tower must be prepared for rockier terrain. The journey from Skorba to Ta’ Ħaġrat takes twenty to thirty minutes by foot, and may be difficult for those with limited mobility. Getting from Malta to Gozo requires the use of a ferry. This runs from Cirkewwa on Malta’s northern coast to the smaller island, with ferries usually departing every 45 minutes. Ferries taking the opposite journey, from Mgarr in Gozo to Cirkewwa, also run every 45 minutes. A reasonably priced ticket covers both outgoing and return journeys. Can I join a guided tour? Most of the sites themselves do not offer guided tours, although an audio-guide covering Mnajdra and Ħaġar Qim is available for a small additional fee. Guided tours that are independent of the Heritage Malta authorities are also available. For example, you can purchase a 5-hour Prehistoric Temples of Malta Tour in either English, French, German, or Italian, in which an expert guide will take you to see the Tarxien Temples, Mnajdra, and Ħaġar Qim. None of the sites mentioned here have cafes or restaurants attached, so visitors must look elsewhere for food and drink. The option that I chose was to buy supplies in the shops around Valetta and Floriana and prepare a packed lunch each morning. That has the advantage of keeping costs down and saves time spent searching for cafes which is better spent seeing the archaeology. Those who prefer a sit-down meal have a few options available to them. 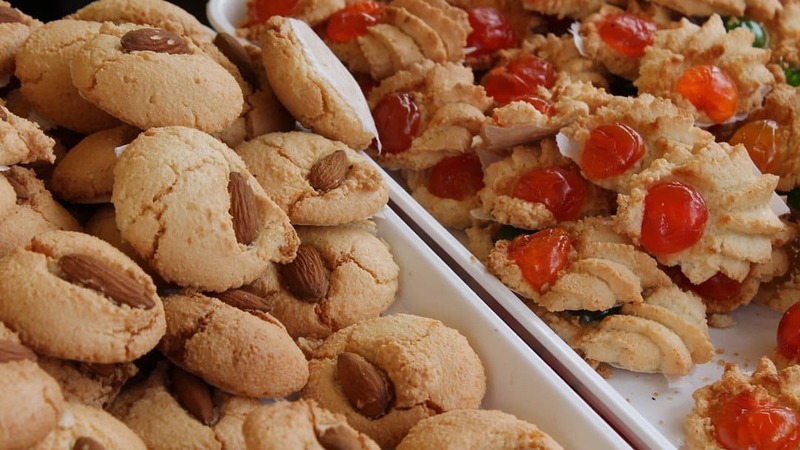 Tarxien and the Hypogeum are in an urban area, approximately fifteen minutes’ walk from the main high street at Paola, where various bakeries and cheap food outlets are located. There is also a small, cheap café close to Skorba. The Mnajdra/Ħaġar Qim visitor’s centre is in a rural environment with few amenities. There is a coffee vending machine, but unless you want a cup of tepid milk I would not recommend it. Those wanting something to eat and/or drink should go to the nearby village of Qrendi or town of Siġġiewi, although I do not have personal experience of either. In Gozo, the Ġgantija temples are in the urban environment of Xagħra, where several cafes and eateries are found, although few appeared open for lunch when I visited. Greater options are available in Victoria/Rabat, the capital city where the Gozo Museum of Archaeology is located. Are there toilets and gift shops? Toilet facilities vary at the different sites. Decent indoor facilities are present at the Mnajdra/Ħaġar Qim visitor’s centre, Ġgantija, and at the Tarxien Temples. There is no facility at Skorba itself, although a public toilet is almost directly adjacent. The only toilet facility at Ta’ Ħaġrat is a portaloo. Guide books and souvenirs are available for sale at several sites, including the Tarxien Temples, the Mnajdra/Ħaġar Qim Temples, Ġgantija, and the National Museum of Archaeology. The museum’s shop sells excavation reports for those seeking more than just an introductory guide to Malta’s Neolithic heritage. Conversely, there are no gift shops at either Skorba or Ta’ Ħaġrat. Small figurines, fridge magnets, and other items drawing upon the iconography of Malta’s prehistory are also available in tourist shops situated on the departure side of the island’s only airport.